A point I would argue is that there should be rather direct correlation between educational level and GDP per capita, which in a contemporary society is considered a basis for well-being and prosperity. University of Munich's Ludger Wössmann wrote the paper as a way to convince policymakers of the strong connection between education and the economy. I first came across the study on Twitter, via former teacher Paul Bruno, and it turned out that Wössmann had looked at a wide variety of indicators, such as unemployment rates and income levels, showing that they're all deeply linked to higher levels of schooling. But the strongest connection might be between student achievement and economic development. Using a host of international exams, such as the Trends in International Mathematics and Science Study, or TIMSS, Wössmann found that student outcomes explained some 75 percent of recent economic development. Or as Wössmann writes in the paper, "empirical research has shown that education is indeed one – if not the most – important determinant of economic growth in the long run." Akavan mukaan pysyvästi heikentynyt osaaminen voi vaikuttaa talouskasvuun erittäin merkittävästi. OECD tarkastelee eri maiden osaamiseroja PISA-tulosten perusteella. Suomalaisnuorten matematiikan ja luonnontieteiden PISA-tuloksen keskiarvo on laskenut 23,5 pistettä 2006–2012. ”Jos tämä heikennys jää pysyväksi ja heijastuu aikuisiän osaamiseen, voi OECD:n raportoimien tulosten perusteella päätellä, että Suomen talouskasvu voi hidastua pitkällä aikavälillä 0,46 prosenttia vuodessa. Vuosisadan vaihteeseen mennessä Suomen bruttokansantuote (BKT) jäisi 25 prosenttia pienemmäksi kuin tilanteessa, jossa osaamistason laskua ei tapahtuisi”, kertoo pääekonomisti Eugen Koev Akavan tiedotteessa. 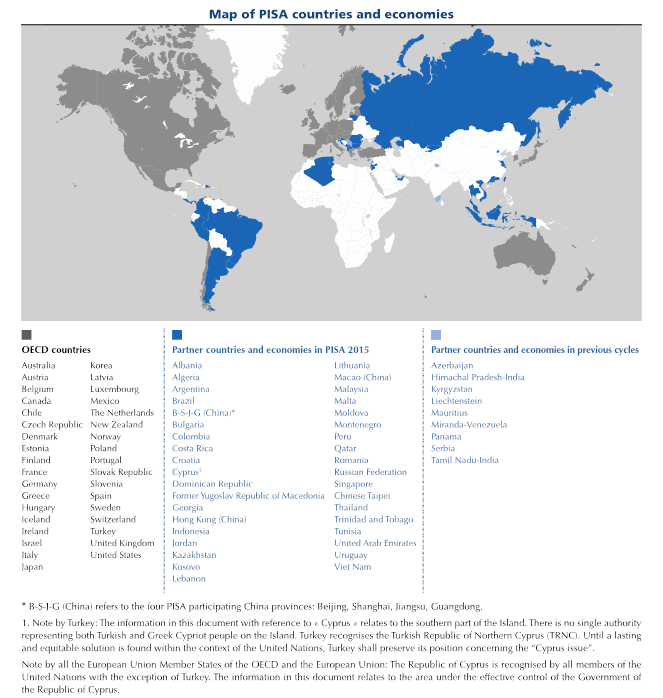 The Programme for International Student Assessment (PISA) is a worldwide study by the Organisation for Economic Co-operation and Development (OECD) in member and non-member nations of 15-year-old school pupils' scholastic performance on mathematics, science, and reading. It was first performed in 2000 and then repeated every three years. Its aim is to provide comparable data with a view to enabling countries to improve their education policies and outcomes. It measures problem solving and cognition in daily life. The Academic Ranking of World Universities (ARWU) uses six objective indicators to rank world universities, including the number of alumni and staff winning Nobel Prizes and Fields Medals, number of highly cited researchers selected by Thomson Reuters, number of articles published in journals of Nature and Science, number of articles indexed in Science Citation Index - Expanded and Social Sciences Citation Index, and per capita performance of a university. More than 1200 universities are actually ranked by ARWU every year and the best 500 are published.